Most fishermen do their best to keep up with creel limits, size restrictions, slot ranges, and gear limitations. It’s often very complicated to follow specific regulations, but true sportsmen pride themselves on knowing exactly how they can legally fish and what kinds of fish they are allowed to keep. It’s especially important to know the rules this time of year, since many species are spawning. That’s why it’s so surprising that one of the most prized and delicious fish in the Chesapeake Bay is completely unrestricted – no limits, no size restrictions, and no rules as to how they can be caught. 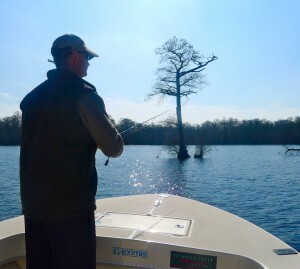 This past weekend I had the good fortune to fish for crappie with light tackle/fly-fishing guide Kevin Josenhans in the tidal Pocamoke River near Snow Hill, Maryland. As fishing guides go, Captain Kevin is nothing short of Chesapeake royalty. He’s been fishing the Bay for over 40 years. In addition to guiding for the past 20 years, he’s spent three decades working for the Maryland Department of Natural Resources including time as a ranger at Janes Island State Park. He knows the lower Maryland Chesapeake region like the back of his hand. His successful late summer speckled trout trips in the Tangier Sound are legendary. I’ve wanted to get out with him for one of those Tangier trips for several years, but I was surprised last week when my buddy Mark invited me along on a trip he had planned with Captain Kevin for crappie and chain pickerel. I jumped at the opportunity. We loaded into Captain Kevin’s 20′ Jones Brothers Cape Fishermen at 9:00 AM sharp. By 9:15, we were on the fish. Since Mark and I are fishing in the CCA Tidal Chain Pickerel Championship, we were using only artificial lures. Mark threw a white fox-tail spinner and I rigged up a tandem set of chartreuse feather flies tied by my friend Woody of Maryland Tackle. I tipped my flies with a small triangular piece of felt soaked in oil of anise, and jigged them beneath a tiny green-capped bobber. Since the fish were near the bottom and at least 12-feet deep and I had so much line below my float, I had to stand on the bow of the boat in order to cast. The crappie ate us up, sometimes hitting two at a time, and it didn’t take long to load the cooler with a nice mess of tasty speckled perch. Since there are no limits, I guess we could’ve caught crappie all day, but we pulled off in search of pickerel. 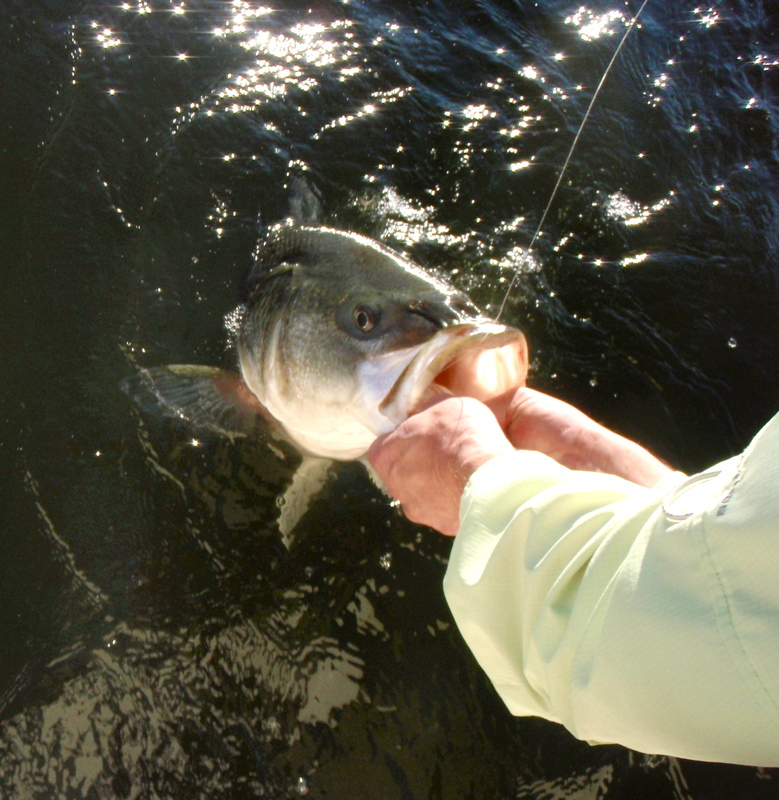 As we were drifting along the shoreline, Mark got hot on la rgemouth bass. Captain Kevin showed us a photo of a largemouth he had caught recently that had black splotches on its body and fins. He told us he had sent the picture to a fisheries biologists who had described it as a pigment disorder. Mark caught three bass on his spinner and they were also all very dark with stark contrasting colors. I suspect it has a lot to do with the color of the water. Part of the northernmost Cypress swamp in the United States, the water in this section of the Pocomoke is stained like coffee or tea thanks to acidic tannins leeching out of decaying leaves on the bottom of the river. Not long after we moved south near the mouth of Nassawango creek, I hooked into a very nice pickerel. Unfortunately, it jumped and threw my lure before I got it to Captain Kevin’s waiting net. Kevin caught another pickerel a little later on up in the creek. 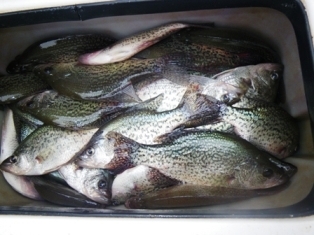 We finished the evening with more crappie back where we found them before. I had a blast fishing the Pocomoke River, and learned a lot about this beautiful area of Maryland’s Eastern Shore. I’m really looking forward to fishing with Captain Kevin again this year, hopefully in late September or early October when the big speckled trout move into the islands of the Tangier Sound. This weekend, I’ve spent some time researching how tidal crappie are managed in Maryland and in our neighboring states. What I learned is that they aren’t managed at all. While the regulations for freshwater crappie are very specific, I was surprised to learn that tidal crappie can be harvested by virtually any method in Maryland. This includes fyke nets, pound nets, gill nets, and traps. I guess you could even go after them with a shotgun if you wanted to. While there aren’t many commercial fishermen who target crappie specifically, there is still an average of 3700 pounds harvested annually. Despite their high-regard among recreational anglers, Maryland has no fisheries management plan and there are no management measures in place. That’s a shame. In other fishing news, yellow perch are red hot in the upper reaches of the Bay and in the most of the Western tributaries. 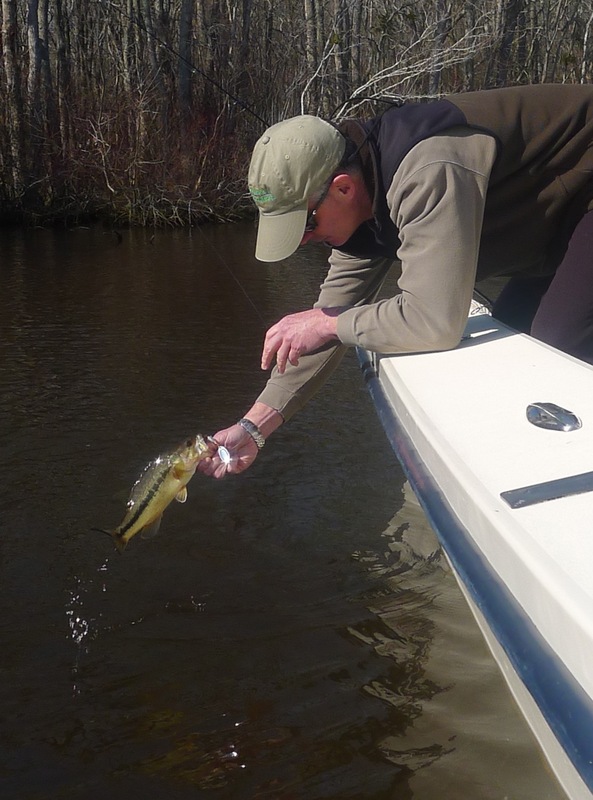 Unfortunately, perch fishing is still very slow on the eastern shore creeks and rivers. I can’t help but wonder if it has something to do with increased efforts toward commercial harvests and they’re getting intercepted by nets before they can reach their spawning grounds. Many eastern shore recreational fishermen are crossing the Bay or driving north to find yellow perch. Pickerel fishing is slow but steady with most of the bigger fish coming from slower water near the mouths of the major rivers. Striped bass catch-&-release fishing is still steady at the Bay Bridge with consistent two- and three-year-old fish in depths of 30- to 45-feet. Striped bass fishing has been slow and inconsistent at the warm water discharges, although it’s possible to turn up a big fish every now and then. This weekend I’ll be speaking at the Maryland Salt Water Fishing Expo and Seminar Series in Annapolis. I’ll also have a table at this event where I’ll be selling and signing copies of my book, Chesapeake Light Tackle – An Introduction to Light Tackle Fishing on the Chesapeake Bay. I’ll be introducing a brand new power point presentation entitled, “Light Tackle Strike Triggers – Provoking Reaction Strikes from Trophy Stripers.” I hope to see you there! NOTE TO EVERYONE: You can now reply directly to individual comments by hitting the Reply button beneath that comment. You can also make independent comments as before. THANKS! Thanks, Shawn. That’s a nice feature since your posts are always thought provoking. I really like the respectful and informative comments we read here too. Great report. If you have any interest in Flounder Kevin was dialed in on them big time last summer. You may want to come back down before nex fall? Hey Mark try and smile once in awhile, fishing is fun. Ha, I thought he was smiling! As close as he ever gets anyway. I like to know more about oil of anise you mention in your crappie fishing article. The 2″ Shad Pole lures I buy have a licorice smell.Is that oil of anise? Where can I buy it? Thanks! Yup, that licoice smell is anise. Probably your best bet is to buy it online, but Whole Foods has it, and so do some other gourmet cooking stores. I saw it tonight at Italian Market in Annapolis. That was unexpected! Nice to see a report again! I too am intrigued by the lower Eastern Shore and will also try to do some exploring there late summer/early fall as well. Good luck with the “pickle” tournament! See you out on the water soon. Phill, I’m still pretty bummed about the poor winter striped bass fishing we’re having in the Bay. As you know better than most, things could turn on a dime though. Thanks for the comments. 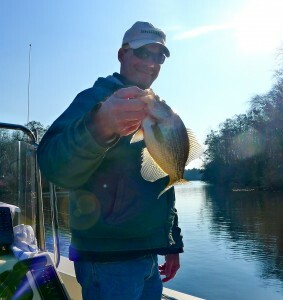 Crappie have scratched many a mid-winter fishing itch for me, too, Shawn…..gotta love ’em. You are right , Phill…..nice to see a fishing report again! certainly not directed at you not reporting, Shawn…just nice that it is getting to be that time when we start seeing reports again. sorry to hear that you were sick…hope you’re feeling better. I agree it is great see a fishing report again! I have a year round vacation rental on Deal Island Water view overlooking Tangier sound. We are walking distance to Wenona Harbor . Bring your boat, charter a fishing trip or rent our 14 ft motor boat. Bill is the real deal, so this isn’t spam. Check it. Now thats what I am talking about! Brings back old memories. Good to see you report and awesome adventure for those tasty treats. Sounds like my kind of trip!!! I thought you might like this report, Creig. Are you turning up any crappie yet? I fished Greensboro and on up to Red Bridges yesterday, Curtis. Nothing there for me. Maybe I missed them but it hasn’t been much of a run yet compared to past years. 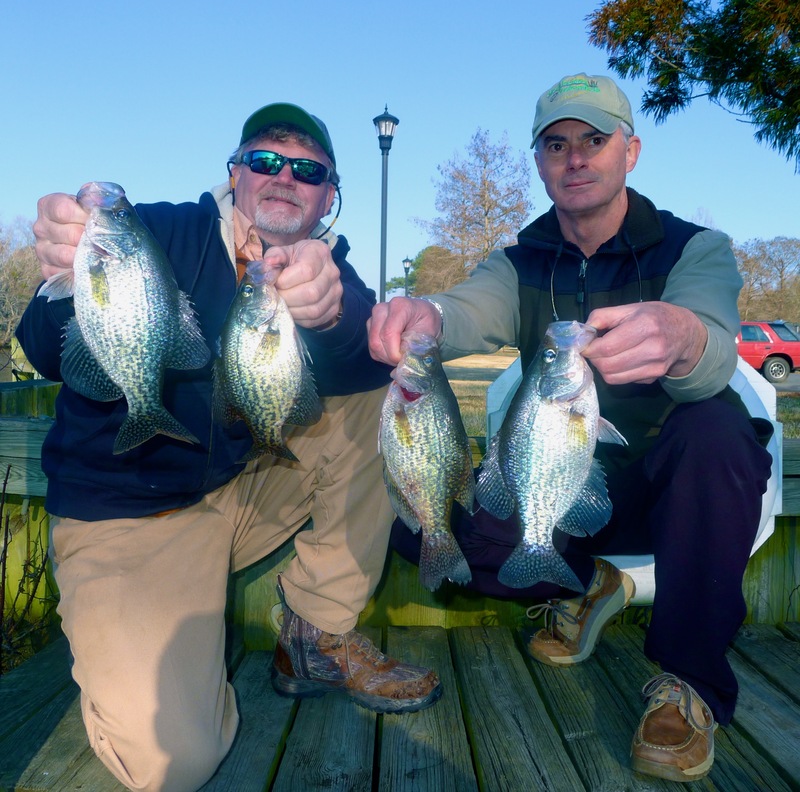 Been catching them in Greensboro for weeks……never seen more than 2 other boats out…..also lots of 20-23″ pickeral…..crappie up to 12-13″ if you look for em….head south…not north…..jig the channel and ledges. Morning falling tide has been most productive. I didn’t know they were taking them out and moving them live, Joe. Interesting info. As you probably know, Dave Sikorski brought up the lack of a crappie management plan about a year ago to the Sports Fish Advisory Commission. I just noticed today that DNR Fisheries Director Tom O’Connoll has initiated and participated in some discussion on the Maryland board at http://www.crappie.com. There are several guys on that board with commercial interests, so I’m not sure he’ll get the best feedback, but at least DNR is interested in coming up with a FMP. The crappie bite continues up here in the way upper bay… on one day… off the next… The Yellow Perch bite has been less than expected… but still way better than it was before the management changes! Thanks for the info on the management news. Thank you for another thought provoking report. I wonder if there are more crappie caught than we think? I wonder the same thing, Carol. My wife and I plan to attend your talk in Annapolis Saturday. We are looking forward to hearing you speak. Thanks, Bill. It’s starting to look like we’ll have a good crowd. I promise to show lots of pictures of Jumbo1. You must be referring to the “suspended fish” catching portion of your seminar..
Good to see a report from you again Ol’ buddy…Glad you’re feeling better..
Now, if the big rockfish will just come on up! Good looking mess of crappie there,Shawn. Glad your back in the swing again! Thanks, RogerT. The pretty weather this week has me wishing I wasn’t sitting behind a desk! Very nice presentation Shawn,especially the photos of the fishes senses particularly the one on sight! I hope to see you on the water soon and would really enjoy an opportunity to fish with you. Thank you, Doug. Thanks very much for stopping by today! caught some nice YP at Martinak a week or so ago. not the big numbers to keep kids interested, but very good size. Looking for a guide that puts you on big crappie. I meant big slabs. I live in the Gaithurdbug area.